As a Copy Editor and Web site Reviewer I thought I would share some concepts on writing with you. Let me begin by mentioning that for those of you that hate to write and have found the need to share your thoughts there is hope! Ghostwriters can effectively create content rich content for your use usually for a very small fee. Look at most all of our President’s First Ladies’ books that have been written in recent years. Each and every one was written by a ghostwriter. For example I have heard it said, Hillary Clinton’s book “It Takes A Village” was written by not one but three ghostwriters. However you don’t have to be famous to take advantage of these services. If you do decide that you want to write your own story perhaps you might want to make note of some of the most misused words and phrases so you don’t get caught in their snares. One of the main sets of words that are used ineffectively and improperly I have already used one of in the previous paragraph, that is ‘effect’ vs. ‘affect’. Think of it this way, effect is the thing that causes the action while affect is the end result. Perhaps that will help you keep those two from being entangled. A wide vocabulary is a repository that pulls together your ideas and generates powerful arguments. Have you ever been in mid thought or sentence and said, “What’s that word I’m looking for?” As an author and editor I find myself constantly searching for just the right word or phrase. One of the most valuable tools to employ is a thesaurus. However there are times when even those will fail you. Perhaps you have been looking for a tool to supplement your current source or one that will assist you in understanding the proper usage and definitions. For the last year I have been using White Smoke. If you would like more information on this wonderful program White Smoke offers a demo at their website at http://network.adsmarket.com/click/imNsnY2ff523YZicZZ1-w4tjmJ6NnYOUjw. It provides not only antonym and synonyms but definitions as well. Another benefit of using this program, for me, is that you can specify the type of writing you are doing and it will provide you with options that fit that writing style. For example, if you are writing a business letter the suggestions it gives for enhancement and replacement are totally different than if you were to specify your content was for dating purposes. I am certain you will find this tool a valuable resource. Words should be fun. Learning to use them properly is imperative in the internet environment. Not only spelling but sentence structure are all laid bare as we are limited to the written word for most of our online communications. The right words in the right form written in a well formed sentence can clarify and fortify your message. Language reflects not only our culture but our ideas. It explains our lives and our life experiences. It is our way of transferring our observations and perceptions to one another. Communication is a two way street. It helps you understand the world and the world understand you. When you use words improperly or even just spell them incorrectly it implies that either you are lazy, misinformed, or just plain uneducated. Another valuable piece of advice is not to overuse ‘big words’ just for the sake of using them. 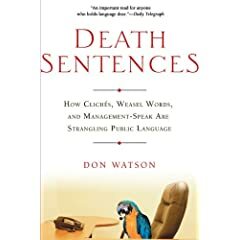 I strongly agree with Don Watson’s principals clearly stated in his book “Death Sentences”. Management Speak (and over usage of unfamiliar terms) will make your listener or reader’s go brain-dead quicker than a Sunday sermon. I offer the following excerpt from a book I recently acquired, see if your brain picks up every word and follows along with what the author is trying to express or if, like me, your brain shuts down and your eyes glaze over. In closing I would like to offer one last bit of advice; grow your vocabulary first then practice using the words properly before incorporating them in your speech and writing. I AM therefore I CAN! When I was a young girl I used to love to prove people wrong when they told me I couldn’t do something. Two little words, “you can’t“, were all it took for me to brave any challenge. I remember even as a young woman being undaunted by those naysayers. My motto then was “I am therefore I can!” Over the years somehow I became a little less daring. I began to listen to that little voice whispering in my ear. A sense of inferiority and/or lack of experience would creep into my being whenever I undertook an unfamiliar task. Recently that little voice began yelling in my ear. Gone was the brave little girl. The older and wiser, set-in-her-ways, woman was in control. This last year I have been telling myself I am going to write an e-newsletter (ezine) and become an eBay merchant. I kept listening to that voice and I allowed it to keep me from accomplishing those two tasks. “You are only a woman, you don’t know how, you will fail!” All of these thoughts and more continually bombarded my mind. However, after listening to a teleconference on Search Engine Optimization (SEO) and hearing how important it is to have both an ezine and an eBay seller account I realized that I had to ditch my fear and just do it! Soon after that decision was made I read a post on one of my internet networking boards that named a source for automating ezine distribution. What timing! What luck! Off I went to check it out and sign up. Now three months passed and I had only gotten half way to my goal. “You can’t, you don’t know how, what in the world would anybody want that you have?” Sound familiar? Yes, it was that still small voice whispering in my ear once more. In the past year I have become an accomplished writer. So why not write a book? I had written articles and even compiled a few eBooks, both for myself and some of my clients, but I had no clue as to what to write that someone might actually pay to own. Then it hit me. Since I had been hostessing weekly chats and writing self-help articles why not write a book on presentational design & skills? Over the course of the next few weeks I wrote what turned out to be a very informative and well written self-help book titled “Presentational Skills for the Next Generation”. The next step was to apply for my selling numbers (ISBN) and bar code. Those would allow me to have others sell my book for me. Resellers like eBay and Amazon as well as being able to eventually print it for sale at the local bookstores could become a reality. This was another scary task. I had instructed other authors to obtain these items but had never had to get them myself. I knew where to go to get this done; it was just a matter of doing it. Three weeks later I had my codes in hand and was sure I would take that final step and get an eBay merchant account. Did I get right to the task at hand? No! Why? Because I had lost my “can do” attitude. I let fear rule my actions. When you don’t know what you’re doing chances are you will let fear stop you. It is that time of year again. The kids are getting back to school and it is time to pump it up a notch with our businesses. What is your idea of getting off the starting block? I was thinking about that the other day and thought that this might be a good place to begin my search. All of these means it seems are just simply the tip of a mountain of ideas. Let’s take the first one for example, advertising. You have online and offline. Then you have to consider what form of online or offline advertising suits you and your clients best. The worst thing you can do is throw good money in the wrong direction. You need to decide first who your target market is and what motivates them to buy. That is a topic for another conversation though. Promotion sort of flows out of the advertising river into a whole new income stream of its own. If you want to promote your business you must first decide whether you want to do it in print or live interaction. Promotion can be done with flyers or you could join a group like the one I ran into recently that stuffs their products with your flyers. What a neat concept that is. You produce the promotional piece. It can be a business card, brochure or even a promotional or sale flyer. Print up 500 pieces and send it to the member that is requesting them and they insert it into their mailings. I would be happy to share this resource with you if you are interested. How about those of us who enjoy the live interaction of an audience? There are multitudes of opportunities to promote your product or service doing seminars and chats. Just days ago I finished writing a book titled, “Promotional Skills for the Next Generation”. I have it for sale in PDF version presently while I am awaiting my ISBN# to be able to sell it through vendors both in digital and print mediums. If you would like a copy just email me and I will be happy to send you your pre-release first edition copy. One thing we fall back on often is the use of sales. These can generate interest and sometimes are the catalyst to revenues from those potential customers who are sitting on the proverbial fence. I have recently begun offering coupon book promotion to my clients as this seems to be a WIN, WIN, WIN! for everyone involved. Companies that would otherwise not let the associate promote their business can use these simple, non-threatening advertising options to their advantage. One thing that I have learned from this experience is that when offering a coupon you would do better to offer a dollar amount off rather than a percentage. Why? Well it seems that people don’t perceive the value of percentage as quickly as they do an actual dollar amount. As for events my recommendation is GET INVOLVED! If you can find the time get involved in putting them together. Attending is one thing and will garner you some networking time but when you are involved with the planning and promotion not only do you gain valuable experience but personal one-on-one with the movers and the shakers interaction as well. Which leads us into networking. As you already know networking is a huge factor in the success or failure of your business. Just do it! Online or off. In person or in the chat room. It really doesn’t matter. This is a powerful tool. Use it wisely. Make friends and let the conversation flow naturally into business informational exchange. Don’t begin with an ad! This is the quickest way to turn the other members off. Have you considered aligning with a charity? This is something that can be beneficial to others while being a promotional tool for you at the same time. Take this opportunity to use the press release to promote your business. During the holidays is a perfect time to make these associations. Whatever your comfort level is, the key is to get off the bench and begin taking the actions to allow your business to grow and flourish. Set a goal, reach for the stars! If you end up in the clouds you have gained at the very least experience.